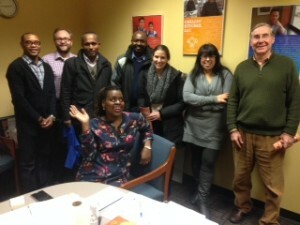 The Welcoming Center was delighted to send ourr small business team to Minneapolis to visit the Neighborhood Development Center last month. 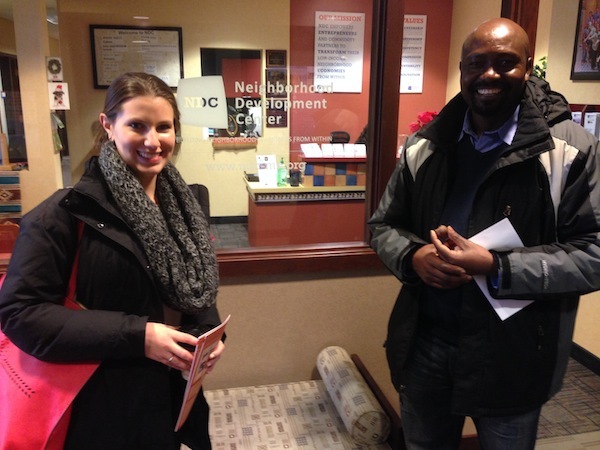 Natalie Cramer and Herman Nyamunga (pictured at right) spent two days with colleagues at the NDC, learning about their work and sharing lessons from our own practice here in Philadelphia. Perhaps the most powerful part of our Minneapolis visit was witnessing the step-by-step progression that connects each of the Neighborhood Development Center’s services. This “vertical integration” allows entrepreneurs to get the help they need at each stage of business growth. Business Training via an in-depth 11-week curriculum. Participants must complete an application and pass an interview to gain admittance.Training is offered both by NDC itself and through partner organizations in various neighborhoods. The Business Lab, which provides technical assistance in areas such as rebranding, storefront improvement, and other business support. Financing through NDC’s own community development financial institution. Loan amounts range from the micro-enterprise level up to $250,000 for eligible applicants. Real estate Most of NDC’s seven properties are multi-use incubators. Their largest project, the Midtown Global Market, is a transformative endeavor which entailed redeveloping part of a large abandoned property with a food incubator modeled after Philadelphia’s own Reading Terminal Market. The market hosts entrepreneurs from all over the world (and from the local community) selling unique and delicious products. Overall, we were inspired and energized by NDC’s deep, sustained community commitment. Their ability to train, lend, provide incubator space and low-cost technical assistance creates a supportive and all-encompassing approach to community based economic development. Perhaps most importantly, NDC has been able to grow and adapt to the needs of their clients while maintaining their mission of working in and for their community. 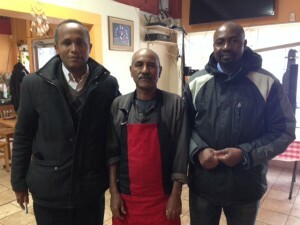 How do you amplify the ability of neighborhood businesses to import and export products from abroad? 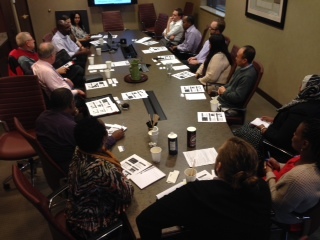 Our staff provided a workshop for NDC and its partners that outlined the Welcoming Center’s process. A few highlights are below. 1. Gather information. 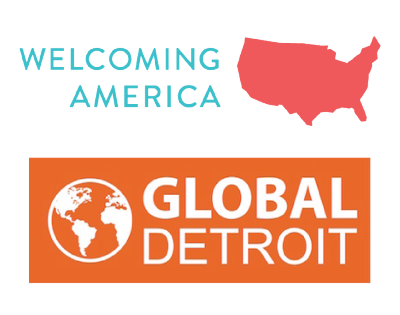 We interviewed 30 immigrant entrepreneurs who were importing and exporting; identified and cataloged the products they were handling; interviewed logistics providers (such as freight consolidators); and mapped the supply chain. 3. Implement solutions. We have addressed these challenges using six different approaches. Two are described below. Providing technical assistance workshops and consultations on topics such as choosing a freight agent or consolidator; maritime insurance; sales and marketing; and financing.